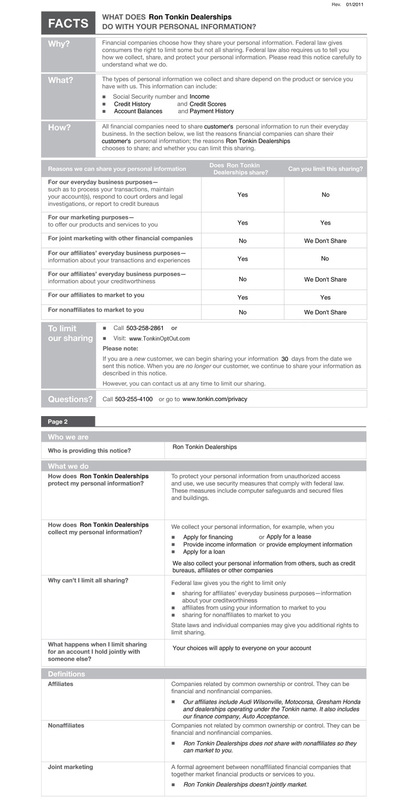 Ron Tonkin Family of Dealerships has created this privacy statement in order to demonstrate our firm commitment to privacy. The following section discloses our information gathering and dissemination practices for this website: Tonkin.com. We use your IP address to help diagnose problems with our server, and to administer our Web site. Your IP address is used to help identify you and your shopping cart and to gather broad demographic information. Our site's registration form requires users to give us contact information (such as their name and e-mail address) and demographic information (like their zip code, age, or income level). We use customer contact information from the registration form to send the user information about our company. The customer's contact information is also used to contact the visitor when necessary. Users may opt not to receive future mailings; see the opt-out section below. Demographic and profile data is also collected at our site. We use this data for other purposes, for example, to tailor the visitor's experience at our site, show them content we think they might be interested in, and to display the content according to their preferences. This site contains links to other Web sites not affiliated with Ron Tonkin Family of Dealerships or Tonkin.com. Such links are provided solely as a courtesy for our customers. Ron Tonkin Family of Dealerships is not responsible for the privacy practices or the operation or content of such other unaffiliated Web sites. Our site uses an order form for customers to request information, products, and services. We collect visitor's contact information (such as e-mail addresses), unique identifiers (such as social security numbers), financial information (such as account or credit card numbers), and demographic information (such as zip code, age, or income levels). Contact information from the order form is used to send orders and information about our company to our customers. The customer's contact information is also used to get in touch with the visitor when necessary. Users may opt out of receiving future mailings; see the opt-out section below. Financial information that is collected is used to check the users' qualifications. Unique identifiers (such as social security numbers) are collected from Web site visitors to verify the user's identity. Demographic and profile data is also collected at our site. We use this data to tailor our visitor's experience at our site, showing them content that we think they might be interested in, and displaying the content according to their preferences. Our online surveys ask visitors for contact information (such as e-mail addresses). We use contact data from our surveys to send the user information about our company. The customer's contact information is also used to contact the visitor when necessary. Users may opt not to receive future mailings; see the opt-out section below. We run contests on our site in which we ask visitors for contact information (such as e-mail addresses). We use contact data from our contests to send users information about our company. The customer's contact information is also used to contact the visitor when necessary. Users may opt not to receive future mailings; see the opt-out section below. Disclosure of Certain Information to Hyundai Motor America. Tonkin Gladstone Hyundai is an independent Hyundai franchised dealership. When you use this website, Tonkin Gladstone Hyundai may provide personal information you enter on this website or otherwise provide to us to Hyundai for Hyundai's marketing and other business purposes. For example, when you indicate that you would like to receive more information about Hyundai and its products, services or offers, personal information such as your name, address, city, state, zip code, email address and telephone number will be provided to Hyundai. In addition, if you buy or lease a Hyundai vehicle from Tonkin Gladstone Hyundai, we may share information about your vehicle purchase (such as vehicle identification number (VIN), make, model, model year, date of purchase or lease and service history) with Hyundai.